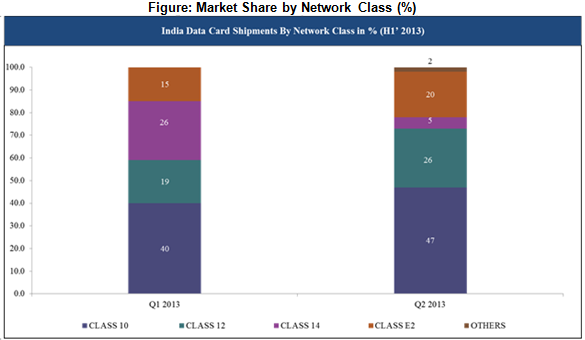 India Data Card Market reported a Total Unit Shipment of 1,851,334 units in CY Q2 2013; representing an increase of 71% as compared to the previous quarter Shipments of 1,08,2181 units. ZTE emerged as the market leader followed by HUAWEI and MICROMAX in CY Q2 2013. According to 6Wresearch, the India Data Card Market registered a Total Unit Shipment of 1,851,334 units in CY Q2 2013; an upsurge of 71% in contrast to CY Q1 2013. ZTE emerged as the market leader followed by HUAWEI and MICROMAX in CY Q2 2013. Further, more than 50% of the data cards fall under the price range of INR 1000- 2000. Additionally, the Universal Mobile Telecommunications System (UMTS) and High-Speed Downlink Packet Access (HSDPA) featured data cards amounted to more than 85% of the Total Unit Shipments. Source: 6Wresearch Quarterly India Data Card, CY Q2 2013. More than 25 vendors shipped Data Cards. Market Share of Unlocked Data Cards has increased by 7% as compared to CY Q1 2013. Top three players together constitute 70% of the total market share. Out of total Data Cards shipped, more than 85% belong to 2G and 3G networks, 65% have 7.2 Mbps speed as well as 35% belong to EDGE Class 10 series. 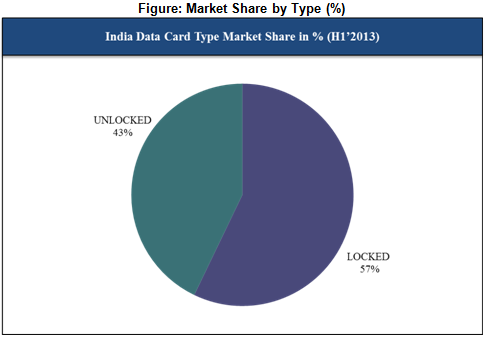 For the CY Q2 2013, the India Data Card Market experienced an astounding growth of around 71% as opposed to the previous quarter. In terms of Total Unit Shipments, ZTE exhibited an increase of more than 100% which enthroned it as the market leader, whereas MICROMAX also witnessed a mercurial rise of more than 130% in its shipments. However, though experiencing an increase of 37% in the current quarter, HUAWEI could not retain its market leader position as compared to CY Q1 2013. Note: Other includes Class1, Class4 and Class E3. With regards to service providers, BSNL experienced an overwhelming increase of more than 130% for the present quarter in its Total Unit Shipments. Further, MTS also exhibited an increase of over 55%. However, AIRTEL witnessed a considerable decline of around 65%. The Total Unit Shipments of data cards supporting 4G networks also witnessed an increase of 25% in CY Q2 2013 as opposed to CY Q1 2013. Qualcomm Chipset installed data cards still dominate the India Data Card Market for the current quarter.